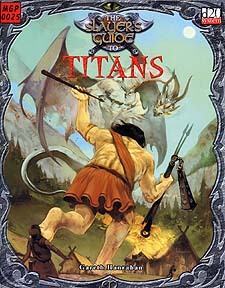 Titans have become the archetype for size, beauty and might. They are powerful beyond reckoning and more skilled than any other race - but still, they bend their knees and serve. Some are the universal archetype of good, others are just as rapaciously evil, but all suffer from terrible rages and fits of emotion. Finally, and most curiously of all, they are said to be "masters of their own fates" - but despite their vast power, the titans seem to have little impact on the world. What are titans? Any one has the power to challenge a kingdom, or shatter an entrenched fortress, but they rarely act for the goals they claim to cherish. Why? Requires the use of the Dungeons & Dragons Player's Handbook. This product utilizes updated material from the v.3.5 revision.